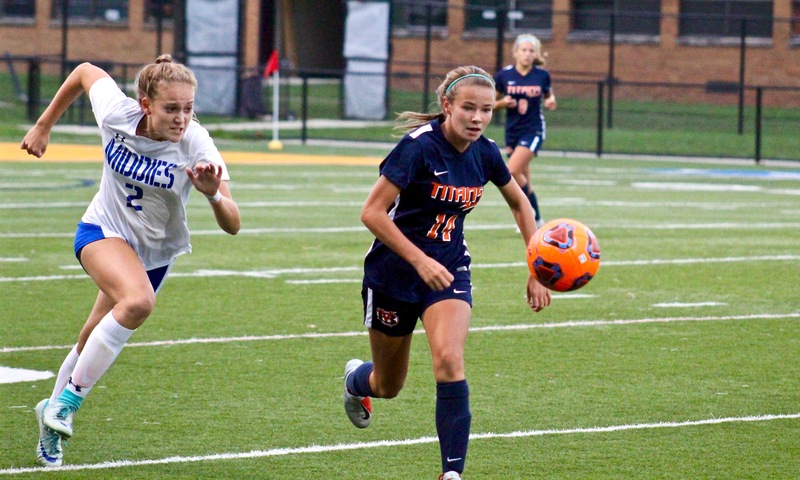 The Berea-Midpark girls soccer team scored three times in its second-consecutive victory, defeating Midview, 3-2, Wednesday night. With the win, the Titans improve to 6-2-0, 3-2-0 in the SWC. Junior Kelly McCarthy started the scoring in the first half for the Titans with the game opening goal in the 28th minute. With a minute to go in the opening frame, sophomore Hallie Krzys sneaked a goal underneath the outstretched goalie’s arm to give Berea-Midpark a 2-0 lead heading into halftime. The Titans continued the pressure in the second half, as McCarthy found the back of the net for the second time on the night in the 42nd minute. Midview would add two late goals, but Berea-Midpark’s defense was strong in the final minutes to pull out the victory. The Titans will host Valley Forge on Saturday September 15th. Varsity will begin at 10 am and JV will play at noon.